Did you know you can keep more money in your bank account just by making residential HVAC energy efficiency improvements? It’s true! Heating and cooling costs account for almost half of your energy bill, so finding ways prevent your furnace and AC from running nonstop can help you save big. Keep reading for awesome HVAC efficiency tips. Depending on your budget, there are a number of ways to reduce energy use in your home by up to 20%. In many cases, you’ll end up recouping the money you spend up front within a year. This one doesn’t cost you anything but can end up saving a lot. When the hot sunlight streams through your windows, certain rooms are likely to heat up quickly. Since this causes your air conditioner to work hard just to cool those rooms, you should close blinds or hang insulated curtains during peak sunlight hours to reduce cooling costs. During the winter, use those same curtains and blinds to trap warm air from escaping through the windows. A new air filter isn’t expensive, but not replacing it can be. Dirty air filters that are clogged with dirt, dust and dander make your system work harder, so swapping it out every few months saves a lot of energy. If you have a pet, you may need to change your air filter every month. One of the best HVAC efficiency tips we can give is to choose an air filter with a high MERV rating which means it will trap smaller particles. Some high efficiency filters can be replaced once a year. Leaving your thermostat at the same temperature day and night is a big energy waster. It doesn’t make sense to heat and cool your home when everyone is at work or school, so think about getting a programmable thermostat to set the temperature a few degrees higher during summer months and lower during winter months when no one is home. One of the newest HVAC energy efficiency improvements is the smart thermostat, which can be adjusted from a smartphone. This comes in handy if you have a sporadic schedule such as soccer practice one night, an early board meeting one morning, or you’ll be in and out of the house on weekends. Carrier Smart Thermostats range from in price (+ installation) and can save you over 20% on monthly energy bills. It’s important to find out which smart thermostats work with your existing HVAC equipment, so be sure to ask Crystal before you make a purchase. If you’re still heating and cooling your home with a system that’s 15 years old, your energy bills are much higher than they need to be. To get the most energy efficient HVAC system, look for ENERGY STAR certified cooling equipment with a seasonal energy efficiency ratio (SEER) of 16 or over, and heating equipment with at least 80% annual fuel utilization efficiency (AFUE). Ask about Carrier’s Infinity air conditioners which offer a SEER rating up to 21, and any Carrier gas furnace which offer up to 96.7% AFUE. The best way to improve your system’s efficiency is by having bi-annual preventative maintenance checkups. Once in the spring and once in the fall, Your HVAC technician will clean coils, check fluids, and change your filter to allow your system to work its best, and make sure there are no issues that could lead to bigger problems down the road. Improving energy efficiency is great for your wallet, but it’s also excellent for the Earth. By reducing the amount of emissions from your heating and cooling equipment, you’ll be doing your part to better our planet. 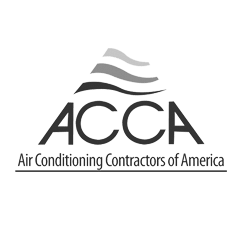 As a member of ACCA, the Indoor Environment & Energy Efficiency Association, we are dedicated to learning about and promoting the most energy efficient standards in HVAC equipment and indoor air quality. We’re always happy to discuss ways to lower your energy bills and reduce your carbon footprint. Schedule an appointment with us today or give us a call! Or better yet, download your coupons first, then call us!